Talk-show host David Frost hires the Unique Employment Agency to find him a traveling companion who will keep nosy fans away so he can sleep on the plane between Los Angeles and London. Unfortunately, he gets Lucy, who keeps him awake with one annoyance after another. It seems they both don't get any sleep on the plane. 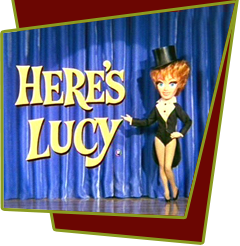 After creating an international incident on the plane, Lucy then falls asleep while appearing on David Frost's TV show to explain it in order to clear his name. Special Notes: Lucille made several appearances on David Frost's talk show and a visit to his TV variety show. This visit to her show was Frost's payback for Lucille helping him out on his shows.